On stovetop bring to boil 1 cup Bluebird Grain Farms’ Farro Porridge in 3 cups of water and a dash of salt. Simmer on low stirring frequently for 10-12 minutes. Turn off heat, remove porridge to a separate bowl and let cool. While porridge is cooling; grate zucchini. Place zucchini in a colander over a bowl, toss with ½ tsp. salt. Let zucchini sweat for 10 minutes, then pat with dry clean towel to remove as much moisture as possible. Place zucchini in large bowl; add farro porridge, egg, and flour. Blend thoroughly until all ingredients are incorporated. Season with fresh ground pepper. Heat vegetable oil in a skillet over medium heat. Drop a spoonful of mixture (about the size of a golf ball) into skillet; cook until browned and crisp. Flatten slightly with spatula and flip fritter to brown on the other side. Keep fritters warm; serve with lemon cilantro sauce. Method: Blend all of the ingredients together in a food processor or by hand. 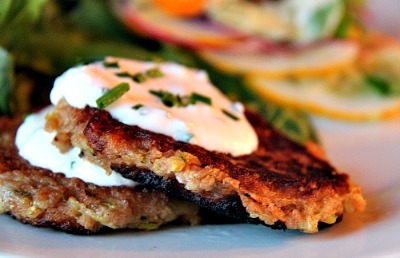 Serve with farro zucchini fritters.